The Keystone State Literacy Association Luzerne County is a local chapter of the Keystone State Literacy Association. It is also affiliated with the International Literacy Association. 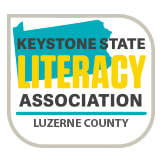 The Keystone State Literacy Association Luzerne County is chartered by KSLA to further the mission and goals of the Keystone State Literacy Association in Luzerne County. On September 1, 2018, the Keystone State ​Reading Association rechartered with the International Literacy Association. The organization's new name became the Keystone State Literacy Association. The Luzerne County Reading Council will now be known as the Keystone State Literacy Association Luzerne County. We will continue to promote and foster literacy throughout Luzerne County.